This 10m dipole was put up just to increase the flexibility of my SO2R operation. Now the 6el tribander seem to be broken because it doesnt work as it should on 10m so this is currently my #1 antenna. I can't say I suffer that much not having a yagi on this band with the solar peak being like it is. Plans are though to get up a yagi on this band aswell but more about that on the future plan page. 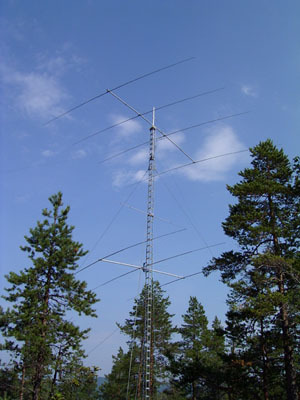 The antenna was constructed from a 10m element of a TH6 that was cut into pieces beacuse of broken traps. I modeled the antenna in MMANA and got a perfect match at the first try and it actually works great. It sits about 12m up between the 4 and 3el mono for 20m.